Today I attended a funeral for a man I never met. Robert Lofgreen was a 68 years old father of nine children and a loving husband for more than forty years. Two of his sons, both very good friends of mine, spoke duringthe service. Under normal circumstances, neither would be clamoring for time at a microphone, yet both spoke eloquently about their father's life, the lessons learned and the memories shared. One son summed it up proudly by saying to those of us in attendance who didn't have the opportunity to meet his father. ..
"I could tell stories about my father forever, but I am proud to say that if you really want to know what my father was like....just know that I am "my father"! "I look like him, act like him, talk like him and share many of the same beliefs that he had about life, love and family." Afterwards, there was a reception and a small luncheonin his honor. There, displayed on a long table, were a myriad of photographs spanning the 68 years of his life. There, on display, were pictures ranging from when he was 4 daysold to some of his most recent. Basically it was a timeline ofhis life lived. As I started at the left end of the table and worked my way right, I saw pictures taken with childhood friends, of his high school years, his years in the Navy, wedding photos and many pictures taken with his kids. Mr Lofgren was an accomplished knife maker. Also there on thetable were a samples of his handywork. He made beautiful knives. Have you ever wondered this questions? If you attended a funeral of somebody that you never met, noteven once, would you cry at that funeral? This questions had never crossed my mind before, mainly because I don't think I had ever attended a funeral outside of my own family. But there I was, very discreetely trying to wipe away tears as I saw and heard stories from this man's wonderful life. I think the answer for most of us has got to be "yes", that we would cry at a stranger's funeral. I don't think my reasoning is anything unique. We all can relate to the many roles that we all play in life. As a son did I do all I could to make my father (parents) proud? As a husband will my wife look back one day and honestly say that she'd do it all over again? As a father, am I acting in ways and teaching the lessons to my children that will make them someday proud to say "I am my father"? Additionally I, like just about anyone, could relate all too well with the photos on that table. They depicted the various stages of life that we all pass through. I'm not 68, but it could have been my pictures on the table and reason goes to tell me that someday day they will. I guess you could say that I had a glimpse of mortality and realized that life really is short and that the family relationships are strongeven after we are gone. While we can't change the fact that we will someday leave this life, we do have a huge say in how other will remember us. I recently heard a saying that really impacted me. 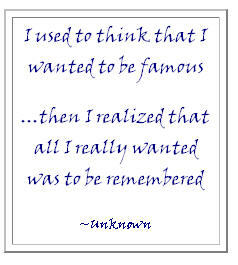 "I used to think that I wanted to be famous, but then one day realized that all I ever really wanted was to be remembered".